RUSH: The Justice Department inspector general, according to the Wall Street Journal — this is breaking news — is reportedly investigating these Comey memos for containing classified information that Comey has divulged. Well, join the club! For crying out loud. Half of this investigation has divulging classified information illegally. None of it by Trump, by the way. 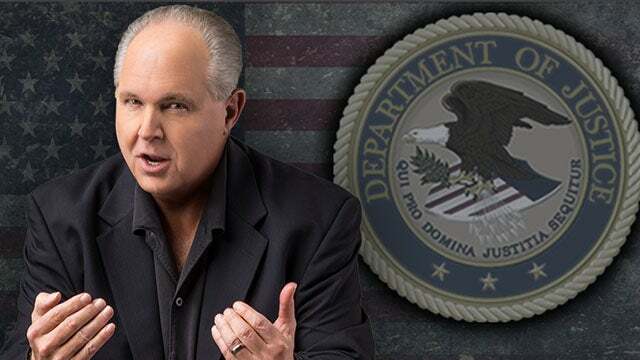 RUSH: You know, I tell you, folks, the more I think about this whole Comey, FBI, DOJ, intelligence community, Mueller investigation, the more of an outrage and a travesty that it is. If these Comey memos had been released a year ago, it would have put an end to any special counsel. But they ended up triggering a special counsel by being delayed when they were. It’s kind of like the Scooter Libby thing. Here we have a special counsel. Remember this? Fitzgerald was investigating, trying to find who leaked the name of Valerie Jarrett, and everybody knew it! It was Richard Armitage. Everybody knew that Richard Armitage had leaked her name to Robert Novak. And the special counsel was ignoring all of that, and they kept investigating people ’cause they’re trying to get Bush, they’re trying to get Karl Rove, and they ended up getting Scooter Libby. Well, here, everybody knew that that dossier was Clinton opposition research! They knew that Trump didn’t have anything to do with it. They knew it! And yet they’re investigating it anyway! It is an outrage! RUSH: The Scooter Libby witch hunt. That’s exactly what this is. It convinces me that I am more right than I even know about what the whole point of this has been! To create massive anti-Trump public opinion that would help them force him from office because there’s no evidence that can be found that would convict him of anything! So now they’re trying to pressure him by charging and convicting other people that had nothing to do with this, but may have had a tangential relationship with Trump. Man, oh, man, oh, man. And in the process, look at the damage they are doing to our country. Look at it! Look at the damage they’re doing to the electoral process, the perception of the entire tradition, institution of American elections. And it’s not the first time. They did this after 2000. George Bush election, the Florida recount. Now, somebody, as I say, has got to try to bring this to a halt. It hasn’t worked. They have failed to gin up public opinion against Trump. They have failed to find any evidence ’cause there isn’t any. And the real culprits are in the process of getting away scot-free with this.